Announcement Welcome to The Scented Retreat. We have a variety of soap favors for your baby, bridal or wedding shower, but If you don't see what you want in the store, please email for a custom listing. We always combine shipping on multiple purchases and use flat rate envelopes or boxes as we can and will refund shipping overages of $1 or more when your order is shipped. Feel free to convo me if you would like an estimate first or I can make a custom listing with all your items and exact shipping. Use the shop search bar to find scents or items you are looking for. If you don't see what you want, perhaps need a different color or quantity, email me to find the answer or request a custom listing. Welcome to The Scented Retreat. We have a variety of soap favors for your baby, bridal or wedding shower, but If you don't see what you want in the store, please email for a custom listing. Wax melts in breakaway clamshells. Oh, such pretty soap favors! Purple and orange soap loaf ready to be cut into bridal shower favors. Customize your labels on your shower favors. Hello, and welcome to The Scented Retreat. 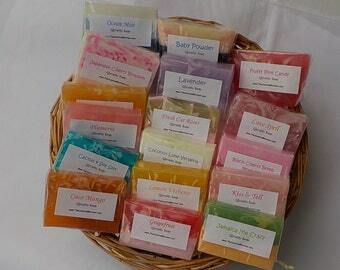 I originally started making soy candles and wax tarts in 2006. I then took a break for a couple of years and in 2012 The Scented Retreat was opened where I now concentrate more on soaps and soap favors for bridal and baby showers. With soap making, the possibilities are endless with size, shape, color, quantity, etc. We are always open to custom orders, so please feel free to contact me with a request for something you don't see listed. We love custom orders for weddings, showers, special events. We also do wholesale and can run fundraisers either through our Etsy store or website. Welcome to The Scented Retreat where you will find a variety of quality soap, bath and body products, and wax tarts.